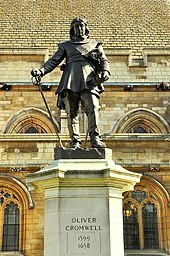 The statue was sculpted by Hamo Thornycroft, and features Cromwell standing holding a sword and a bible. The bible is marked "Holy Bible 1641", and while the main statue of Cromwell is marked "Hamo Thornycroft 1897", the lion on the base is marked "1899". Following the fire which destroyed parts of the Palace of Westminster in the 19th century, the question whether or not Oliver Cromwell should have a statue in the reconstruction of the Palace was debated in the pages of The Times, and Punch magazine satirised the issue. The question was raised once more in the House of Commons in 1856, with John George Phillimore saying "any man who could object to a statue of Cromwell must be imbued with bigotry and party spirit in the highest degree". It was raised several more times over the following years by supporters of a statue. The government publicly proposed a statue of Cromwell for the first time in 1895, which immediately resulted in members of the public questioning the decision due to the divided opinions about Cromwell. The proposal ended in a parliamentary debate and vote, in which the Government narrowly avoided defeat when the Unionists sided with them while the majority of the Conservatives and the Irish Nationalists voted against the measure because of Cromwell's history in Ireland. The decision was condemned by newspapers in Ireland. Following further opposition from the Irish National Party, the proposal was withdrawn on 17 July 1895. Herbert Gladstone, First Commissioner of Works, approved the statue with the funding coming from an anonymous private donor. In 1899 his successor Aretas Akers-Douglas confirmed the statue's proposed location as the sunken garden next to Westminster Hall. The statue, cast in bronze by Singer of Frome, was unveiled on 31 October 1899, followed by a speech on Cromwell by former Prime Minister Lord Rosebery, who was later revealed as the anonymous donor who paid for the statue, and whose wife was the sole heir to the Rothschild's family fortune. In 2004, a group of Members of Parliament including Tony Banks proposed a motion that the statue should be removed and melted down. The move was not supported, and other MPs suggested that the statue should be moved somewhere else. Restoration work took place in August 2008, removing dirt and a coat of black wax which had been previously applied to the bronzework. This changed the colour of the statue from black to a more natural brown, and potassium sulphide was applied in order to even out the colour of both Cromwell and the lion. It was coated in a clear wax in order to ensure that the natural finish remained. The conservation work was completed in time for the 350th anniversary of Cromwell's death on 3 September 2008. ^ a b "Cromwell conservation work". Parliament.uk. Retrieved 2 August 2012. ^ "Cromwell online exhibition". The Cromwell Association. Retrieved 2 August 2012. ^ "House of Commons". The Times (34606). 18 June 1895. p. 6. Retrieved 2 August 2012.